The part of NY 352 featured on this page is a short connector route in Elmira, the remnant of NY 14 when that route headed outside town to use the Horseheads Bypass. West of Elmira, NY 352 started life as NY 17E out to Main St. (original 17) in Big Flats, and ended at Madison Ave. in Elmira (14 and original 17). When NY 17 came through as the Southern Tier Expressway and took over the Bypass, NY 14 went back to its old alignment, leaving NY 17E and then 352 to fill in the rest. North/east of 17, 352 continues as Chemung CR 1, which once ran west into NY 17 as part of an offset interchange (EB off/WB on were to Jerusalem Hill Rd./CR 1, and WB off/EB on were to Water Street, which is now 352 East). All photos on this page were taken eastbound, and because NY 352 was later split into a one-way pair, this is not the route that NY 14 once followed - that would be Church St., which carries NY 352 WB. Old-style NYSDOT mileage marker, with the route number larger and digits widely spaced. 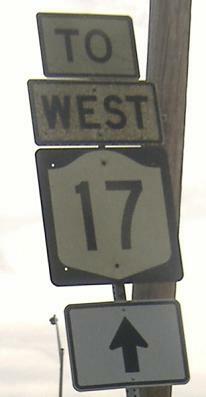 The TO WEST 17 probably dates from when NY 17 took over the Horseheads Bypass, and the arrow looks new (using arrows beneath TO assemblies is a recent practice in New York). Unusual signs at the NY 17 interchange. West Ramp Roadway is a fancy name for "how to get onto the freeway," while Jerusalem Hill points NY 17 EB traffic up CR 1 (NY 352 ends just across the interchange at the westbound on/off ramps). The last photo is on the page because I can always argue the LGS is on 352, and NY 17 has enough photos.